Previous edition: New York: Portfolio/Penguin, 2014. This is not a crazy, idealized notion. Today, in many successful organizations,great leaders are creating environments in which people naturally work together to do remarkable things. 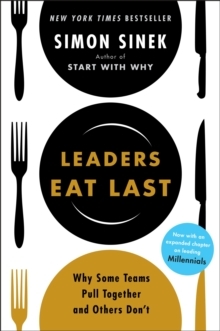 In Leaders Eat Last, Simon Sinek, internationally bestselling author of Start With Why, investigates these great leaders from Marine Corps Officers, who don't just sacrifice their place at the table but often their own comfort and even their lives for those in their care, to the heads of big business and government - each putting aside their own interests to protect their teams.